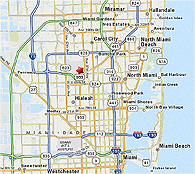 Miami-Opa locka Executive (OPF) is located 7 miles North of Miami International Airport, 12 miles NW of city center, and 3 miles from Sun Life Stadium. OPF, the largest of Miami-Dade County's four General Aviation Airports, has an operating staff of 7, and is open 24 hours a day, 7 days a week. OPF handles a variety of private, pleasure, and business flights and is a reliever for Miami International Airport. During 2016 this Airport recorded a total of 134,500 flight operations. OPF has one of the longest general aviation runways in the country at 8,002 feet and is a Releiver Airport for Miami International Airport. Runway 9L/27R can handle virtually all types of aircraft. Three instrument landing approaches permit operations in both VFR and IFR conditions. U.S. Customs at Miami-Opa locka Executive Airport operates on a daily schedule from 9:00 a.m. - midnight. OPF supports the business aviation community, light cargo traffic to the Caribbean, and large aircraft maintenance facilities. The Airport offers the services of three (FBOs) - Atlantic Aviation, Fontainebleau Aviation, and Signature Flight Support, all of which provide service to small single-engine private planes to large corporate jet aircraft. All facilities provide 100 octane, low-lead gasoline and Jet-A fuels. Major/minor airframe and power plant repair services, high and low pressure oxygen and replacement bottles can also be obtained. Hours: 7:00 a.m. - 11:00 p.m., local time. 9:00 am - midnight, daily. One hour advance notification required, through ATC (Extended hours available upon 3 hour advance request. Contact (305) 874-5403. Miami-Opa locka Airport was founded by Glenn Curtiss in 1927 on the grounds of what used to be his Florida Aviation Camp. Mr. Curtiss gave his Florida Aviation Camp to the US Navy shortly before his early death in 1930. Miami-Opa locka Airport was part of U.S. Navy Training Command during WW II and the hub of 6 Naval training bases. Amelia Earhart took off on her ill-fated around the World Flight attempt in 1937 from former "Miami Municipal Airport" located near the Airport's main entrance. Numerous historic aircraft and buildings still remain on site. U.S. Navy Dirigible "Akron" crashed in a thunderstorm on its 1933 return flight North after leaving Miami-Opa locka. In the Cold War era, Miami-Opa locka Airport played a part in both military and civilian efforts, including the infamous Black Flights to Guatemala in the 1950s, the Bay of Pigs invasion and the Cuban Missile Crisis. The Airport served as the Miami Naval Air Station and Miami Marine Corps Air Station during the Korean War. In early 1962, the deed for the airport was signed and the transfer to the County and the Miami-Dade Aviation Department was completed. In 1967 Opa-locka was the World's busiest airport with over 650,000 flight operations. In 2014, Opa-locka Airport was changed to Miami-Opa locka Executive Airport. To date, it still has a military presence with the U.S. Coast Guard Air Station, which houses the World's Busiest Air/Sea Rescue Station. Attended continuously. Birds in vicinity of airport. Dual traffic patterns for helicopters and fixed wing aircraft in use Runway 9R-27L. Noise sensitive airport. Flight training limited to aircraft 40,000 pounds maximum gross takeoff weight and below, and only between 7 a.m. - 9 p.m. Specific traffic patterns are published for helicopters and fixed wing traffic; compliance is mandatory. Helicopters avoid flying over parked or taxiing aircraft. Flight notification Service (ADCUS) available.